Media captionLauren Biermann: "We've been concentrating on getting the science right; the next step is automation"
But the approach works by looking for plastic's reflected light signature in the water. And early trials conducted by the UK's Plymouth Marine Laboratory have been very encouraging. 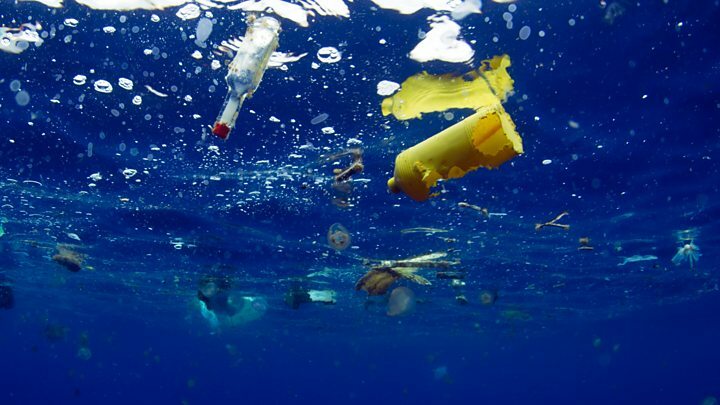 "You're never going to see an individual plastic bottle floating on the sea, but we can detect aggregations of this material," Dr Lauren Biermann told BBC News. So where did the Mars methane go? The Earth observation scientist has been experimenting with the EU's Sentinel-2 satellites - a pair of orbiting multi-spectral instruments (MSI) that were launched in 2015 and 2017 and are operated by the European Space Agency (Esa). The duo's mission is primarily to make a continuously evolving map of Earth's land surfaces, but in the process they also capture a view of coastal waters. And, actually, this is the key zone of opportunity if you want to monitor plastic discharge to the ocean, because much of the eight million tonnes globally that's thought to make its way out to sea every year does so through rivers and their estuaries. The second factor working to Dr Biermann's advantage is simply the quality of the detectors in the Sentinel instruments. These have great clarity in the way they sense the different wavelengths that make up light. And the Plymouth scientist can use this performance to interrogate the individual pixels in a picture to see what objects they're likely to contain even if they can't be directly resolved. It works like this: seawater absorbs light strongly in the near-infrared. Plants and anything else floating in the water will reflect in the near-infrared. But plants will absorb well in the red band, whilst plastic less so. Further information can be gleaned from the "red edge" and shortwave infrared bands, also. "Vegetation has a good signature that we can look for, whereas plastic has a different signature," she explained. "So, we can start to un-mix the pixel and say, 'Right, how much of this pixel that I've detected that is nice and bright in my new floating debris index - how much of it seems to be plant material, and how much seems not to be plant material?'" Developing the index has involved validation work in which the Sentinels have overflown great "forests" of sargassum seaweed and even panels and bottles of plastic laid out on the water by scientists from the University of the Aegean, to get a better idea of the spectral differences between the materials. Dr Biermann sees satellite observations being used to monitor improvements at those known river hotspots for plastic discharge. The information could also be allied to other datasets to make assessments of the pollution's impacts. "If you know where your whales or dolphins or other charismatic megafauna are foraging, you want to see perhaps how much of a risk they are at from these hotspots."